Please give us a call at +2721 424 8254 or simply visit us at 76 Shortmarket Street, Cape Town. 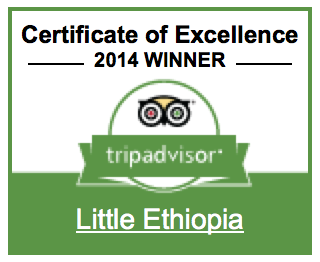 as chosen by Mail & Guardian, TripAdvisor, EatOut and most importantly: you! We make our food from scratch, using the freshest, newest ingredients with the best, ancient recipes. Injera, shiro, tibs, doro wot & vegetarian dishes; you’ll find them all. Delicious & affordable.